There’s nothing worse than a leaking roof! Now is the best time to make sure your roof is in good condition before the summer storm are upon us. When hurricane season approaches you might get stuck and you won’t be able to get the repairs you need done. But what causes your roof to leak or your tiles to become loose in the first place? Why does it happen? Lucky for you, we have some answers! Knowing these may even help you avoid loose roof tiles before they become a bigger frustration later on. Florida is known for experiencing some of the strongest hurricanes – like hurricane Irma in 2017, or Michael in 2018. These storms bring torrential rain and gale force winds, which cause immense damage and wreak havoc on your roof. These conditions are enough to loosen roof tiles and even break them. The best thing to do after a hurricane (if you suspect any damage was caused) is to get your roof checked out by a professional company. If left unchecked loose or broken tiles will let rain enter your roof and could cause your ceiling boards to rot and leak water into your house. Naturally, having a leak in your home will also probably end up creating even more issues with damage to other furniture and areas in your house than just a few loose tiles. If you suspect that your roof tiles are older than 25 years it might be time to get them checked out. After being weathered and aged by environmental factors, tiles will naturally start to deteriorate, and could become brittle or crumble. This aging will cause them to become loose and could cause leaks. You would need a professional to come and assess the age of the tiles and help you decide if and when you will need to replace them. The flashing is the thin metal strip installed at the seam of the roof tiles to create a watertight barrier. If this has been damaged either in a hurricane or through normal aging it could become a problem. This will lead to leaking and could damage your ceiling. 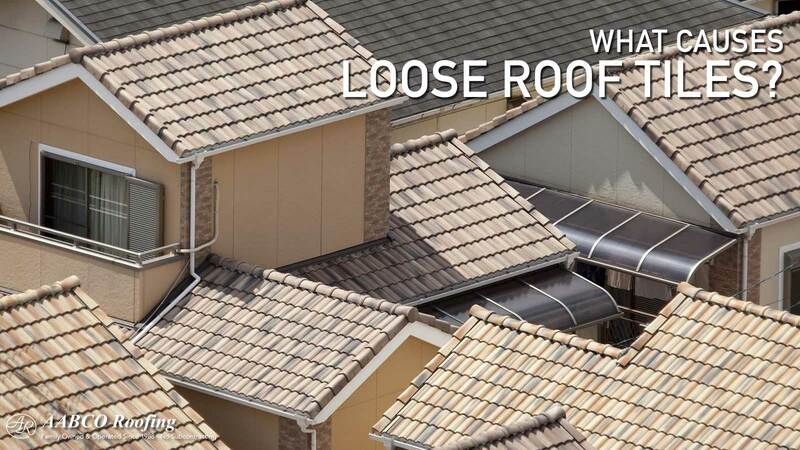 When you notice a leak or loose roof tiles you need to get the roof flashing repaired checked too. If the flashing has been installed incorrectly or is damaged this can also cause problems in the long run and become an expensive fix down the line if left unattended. A major problem that can occur is when home owners try to do some DIY when it comes to their roof repairs. The major problem with this is that homeowners generally have no idea where they can and cannot walk. A skilled roofer will know the strong and weak points on a roof are and will know how to delicately navigate your roof to avoid causing damage. If you were to walk on the weak areas of your roof, it could cause the roof tiles to break or come loose. Added to this is the DIY repair that you want to make could result in a serious damage due to inexperience – not only to your roof but to you as well as you don’t have the correct safety gear and procedures in place. Always make sure to hire a professional when you suspect a problem with your roof, if you try to repair it yourself it could end up costing you more money (and a few broken bones) if you are not careful. A big issue that has come up many times when AABCO roofing does inspections on residential home roofs, is the quality of roof tiles and how they’ve aged. A big factor in the life span of your roof is the current condition of the tiles and how they were previously installed. If inferior products have been used in the previous installation, the roof won’t have the strength or durability to withstand the Florida weather patterns. These ranging temperatures can put a lot of stress on roofs. When these stresses start to come into effect, your roof will start to fail. There is no telling how long this could take, it could be at any time, more likely sooner rather than later and obviously when you are least prepared. Always make sure you get a trusted roofing company to install a quality roof. One of the biggest destroyers of roof tiles during hurricanes is flying debris. This can be tree branches, fence posts, wooden framing and even other roof tiles. This damaged caused could range from minor to extensive. When roof tiles have been damaged in this way it is best to get a professional to come in and check the roof structure as well as the tiles. Your roof tiles are the first line of defense against weather damage to the roof’s underlayment and eventually in your home. So, before the hurricane seasons sets in, it would be prudent to have a professional come through and inspect any areas of concern of your roof. This might seem like an expense you don’t need, but in the long run it could end up saving you thousands of dollars. So always make sure to use qualified, trusted roofer like AABCO roofing to make sure you have peace of mind about your roof.